Logan Circle is a newly upscale neighborhood in the northwest quadrant of Washington, DC. The neighborhood combines a traffic circle and two historic districts and is named for a former Civil War hero and Senator, General John Logan, who briefly made his home there. Originally called “Iowa Circle,” Logan Circle sits at the intersection of 13th Street, P Street, Rhode Island Avenue and Vermont Avenue and is the only major circle downtown that remains entirely residential. 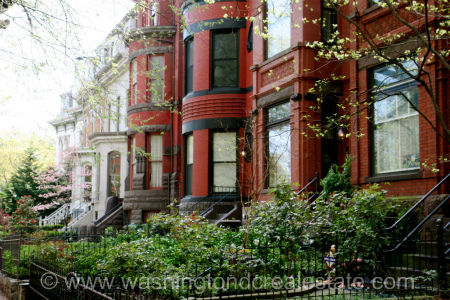 Read more about Logan Circle real estate. Logan Circle has made a dramatic transformation over the last 20 years, as the commercial corridors along 14th Street, the main thoroughfare were revitalized, bringing in new retailers, restaurants and art galleries. In 2000, Whole Foods Market opened, driving additional growth and gentrification. The neighborhood is best known for its elegant Victorian brownstones, many of which have been restored in the last decade. Prospective residents can also choose from several new condo developments. Logan Circle is served by several Metro Stations, including Dupont Circle; McPherson Square; Mt. Vernon; Shaw-Howard; and U-Street. The neighborhood is bounded by S Street to the north, K Street to the south, 16th Street to the west and 9th Street to the east.